Part 15 - Rocker Rust -- Nice Brass! Two days ago, I got out the torch and brazed the quarter panel back to the rocker cover. As you can see in the picture below. I needed to use quite a bit of filler rod (which, by the way, is made of brass, hence, this page's title). I thought it turned out pretty well but when I looked at it yesterday, I decided to do a little more smoothing. I didn't get a good shot of the second round of work today but it does look a little nicer. Luckily, the factory brazing looked pretty bad here as well so I don't feel too bad. 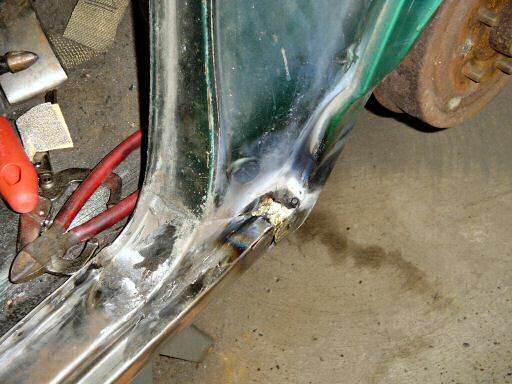 I also brazed the quarter further down on this area where the end of the quarter panel tucks under the rocker cover. After I finished with the brazing work, I started stripping the rest of the rocker cover. When I fixed the cowl, I didn't strip the entire thing so all of the existing runs in the spray paint showed through. I didn't want to repeat that mistake here. I also ended up having to remove the front door. 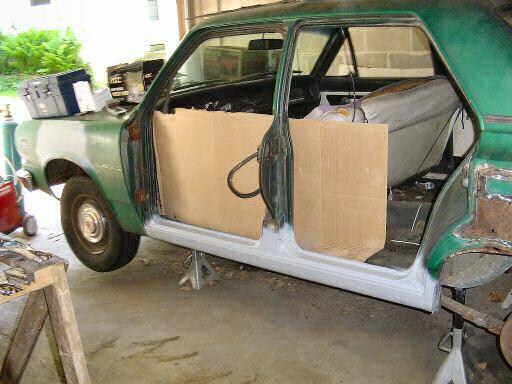 After the fiasco with the striker on the rear door, I was a little hesitant to do this but as it turned out, the biggest problem I had was how to hold the door up and remove the screws at the same time (a floor jack a block of wood was the solution there).